You get all of your friends to like your page. You buy likes. You run around liking pages, leaving messages on their timelines to like you back. You join in on Fan Page Friday, listing your page so that you can be liked. You pay for really cheap likes in irrelevant countries (bots) that don’t lead to business. You do this all for a number. Because you think it’s important to build that social proof. Or the mirage of social proof. And to a point, you’re right. I’m more likely to take your page seriously if you have 5,000 instead of 5 likes. After that, you need to provide value. So… no big deal, right? Doesn’t hurt anyone? We end up with your sorry bot fans liking our page. Hey! We’re Not Big Enough! Your boss comes to you with a problem, and he/she isn’t happy. Your boss actually has no idea whether Company X is making tons of money or that people love them. But the perception exists that this is the case. And, hell… Your page has only 58 likes! So you’re doing something wrong. You start obsessing over Company X. You aren’t going to buy likes. You aren’t going to swap likes with people who don’t care about your brand. You’re going to do it the right way. You’re given a hefty monthly budget of $3,000. You use that with the goals of increasing likes and engagement. So you create Page Like ads and you promote posts. You’re doing it the right way. You listen to me, and you follow my instructions precisely. You care more about quality than quantity (but you need to get to that 50,000!). So when you create that highly targeted Page Like ad, you make sure to only target Company X in the interests. After all, they are your biggest competitor. They offer a very similar product. If a person likes Company X, they’re bound to care about your brand, too! You get new likes. In fact, they’re cheaper than you expected. Your boss is happy. The engagement you’re getting is worthless. Comments on your post include spam and nonsense. And the few real people who comment on your posts are angry that you’re in their News Feed. Why are they angry? This is a highly targeted audience. Your product or service should be relevant to them. This is the big issue with targeting on Facebook. If you’re going to target the audience of a particular page, for example, you’re putting faith in that brand for building their audience the right way. But maybe they didn’t. Or maybe they did, but they targeted another brand they respect that wasn’t doing it the right way. It’s easy to pollute targeting with one sleazy advertiser. While interest targeting can be highly effective, this is a major hole. It’s why you should first focus on Custom Audience (customer email list) targeting and FBX (website retargeting). In these cases, you have much more control over the quality of your audience. I know you want more fans. I know you have pressure to grow. 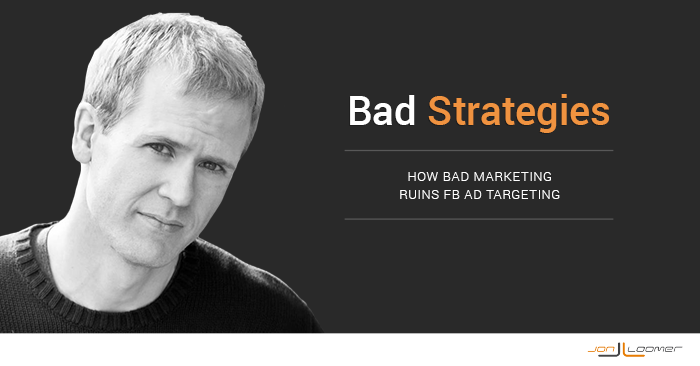 But the more sleazy marketers are out there, the more targeting is watered down. Eventually, we’re just targeting a bunch of bots and people who liked random pages as favors. A good way to test the quality of another brand’s audience is by promoting something that leads to a registration or purchase. It tends to be much more difficult to get sales out of non-fans, but if you can get some initial registrations or sales out of this group, you are on the right path. Even if you don’t use such a strategy, be smart. Don’t buy likes. Don’t swap likes. Don’t ask people who have no interest in your brand to like your page. Your goal is to build a highly relevant audience that is likely to buy from you. This obsessive like-building makes things tougher for the good marketers, but it also ruins things for users. I’m sure you’ve heard the complaint a million times. “I never see ads that are relevant to me!” Well, part of that is bad marketing. But the other part is likely your own fault. Do you like a friend’s page because he asked you to do it? Are you exchanging likes with other pages to help build your own? When that happens, you confuse the hell out of Facebook. Facebook’s trying really hard to understand who you are and what you like. When you start liking things you don’t actually like? That’s a bit of a curveball. So, you’re right. You aren’t seeing relevant ads from brands you care about. Because Facebook can’t read your mind and you’re sending them the wrong signals. If you want to make Facebook the best possible experience for yourself as a user — and even be served ads that you care about — start telling Facebook what you actually want to see. What strategies do you use to target your most relevant audience?